Wil is turning 30 on the 30th... that's right our little princess is having a GOLDEN BIRFDAY!!!! You guys remember Beychella? Well it's going to be a LOT like that but with a little MORRREEE... how do you sayyy... FUP-SKA-DOOP!! 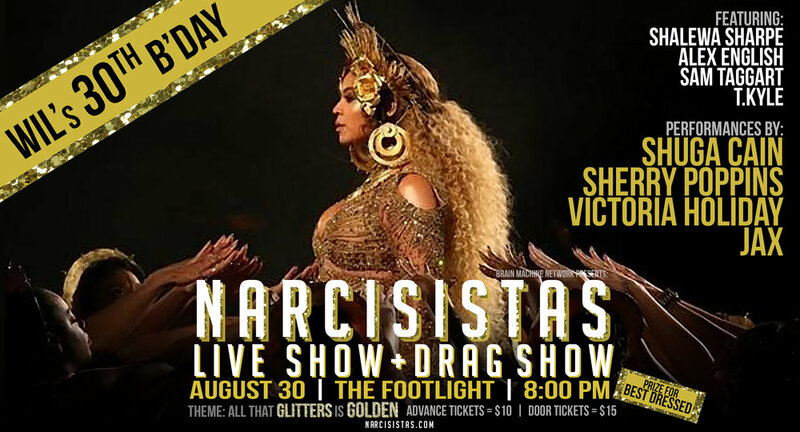 Come join your fave Narcisistas for a LIVE Podcast recording! Drag Show! DJs! Comedy! Coreo! Leif! SPECIAL guests and SO MUCH MORE!! It's the BIRTHDAY celebration of the CENTURY!! The THEME of the evening is ALL that GLITTERS is GOLD so dress to IMPRESS GALZ! This is a MUST NOT MISS! August 30th DOORS 8pm SHOW 9pm DJ to Follow! We can't wait to see you squirrels there!